Awarded a total of £12,900 since 2006. 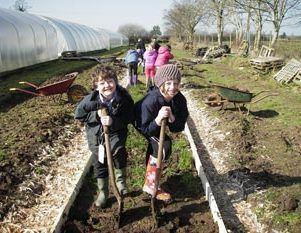 The centre offers school children, young people, the general public and disadvantaged and special interest groups the opportunity to understand and experience sustainability in farming, food, wildlife conservation and renewable energy. The farm’s 220 acres features a range of environmental habitats including: Woodland Margin; Aquatic – River & Pond; SSSI (site of special scientific interest), Ancient Woodland, Improved and Unimproved Grassland and Wetland. A recent grant funded 5 days’ worth of work in the natural environment with groups of people with learning difficulties/mental health issues. The types of activity undertaken were hedge laying, pond habitat improvement, tree planting, carrying out a species survey, exploring the woodland habitat and undertaking a farm walk focussing on the sites of special scientific interest.